The one and only thing for which windows 10 is being criticized a lot is its attempt for privacy invasion of users. With its default enabled tracking features, its has stretched the limits to which an operating system can go in spying users. In order to provide a more personalized experience, it is seeking data out of users. One option is to not upgrade to windows 10, which is not really an option. Microsoft will eventually end support for windows 7 and 8 in next 5-7 years. And recent news confirms that windows 10 is forcefully pushing updates to windows 7 and windows 8 users by secretly downloading updates for the upgrade. You wish or not, eventually you will have to be a part of Microsoft data Logging system by choosing windows 10 or you have to be a rebel and choose Linux. Now, let us focus on this spying problem. One option is that you go ahead and tweak settings one by one and turn off all windows 10 tracking features . The other short and easy method is to use some free open source tools available on the web to disable all spying features in just a few clicks. 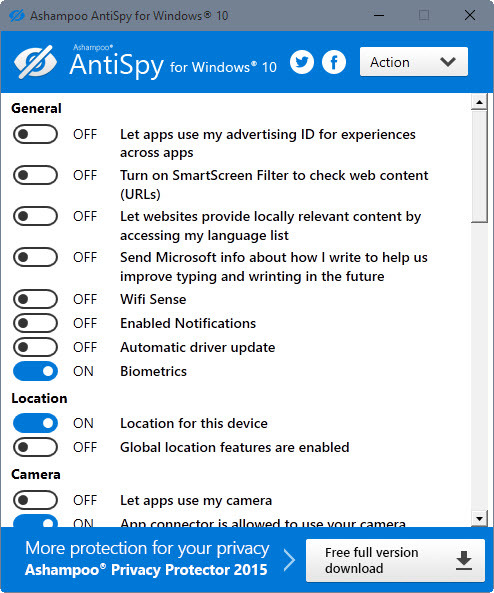 Here are top 3 best donotspy tools for windows 10. 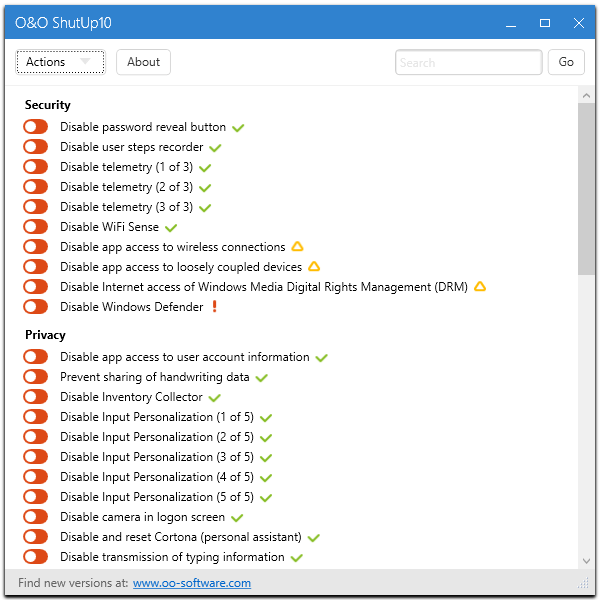 O&O ShutUp10 is a free tool which lets you disable more than 50 spying features of windows 10 at once. You can choose to opt out of certain features if you really need them. The best thing is that it do not need to be installed (Portable software) on your PC. You just download and run this program and with a simple interface, you can easily tell windows 10 to respect your privacy. If, in future, you change your mind, you can undo all changes by using this software again and choosing to undo all changes to get back to where you started. It also optionally lets you create a system restore point at the time of tweaking these settings. Just go to the download link given above and scroll down the page and below download section click on DisableWinTracking.exe to download the freeware. This free tool posted on GitHub was first among these anti-spy tools. Just run this exe file and check all the options like Disable telemetry, Block tracking servers etc. and click on Go private. You have two options before going private and those are namely Delete and disable. If you choose to delete, the services will be deleted while disabling them just make them dormant. In this tool also if you plan to go back, just press revert after running this software again and all the older settings will be applied again. Note that you must be logged in as admin to run this tool. It stops data logging, disable location tracking and stops Microsoft from sending your diagnostics and usage data. Like all other tools, you can choose which settings you want to apply and which you don’t. It tells you to create a system restore point before installing this software which is recommended as it will let you revert back to settings in case.